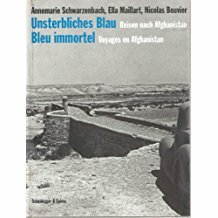 Annemarie Schwarzenbach: Où est la terre des promesses? Schwarzenbach’s descriptions of the beauty of the places through which they travel have a lyrical, almost ethereal quality to them, and more than once I did wonder if she had been under the influence when she wrote. There is a genuine sense of thrill, excitement even, at being on the edge of what was regarded as the civilised world, further and further from the cotton-wool safety of the West, even as it moved inexorably towards another war. There is a Westerner’s innocence as she describes the simplicity of people’s lives and their great friendliness and hospitality; nevertheless she is aware of the difficulties they must undergo, particularly during the harshnesses of winter in the Hindu Kush or the foothills of the Himalayas, and of the limitations to women’s lives under the strictest of interpretations of Islam. In fact, these are the most interesting sections of her book: as a woman, accompanied by another woman, they do have access to so much more than a male traveller would ever experience, and Schwarzenbach does her best to ask questions and discover the truth about how women feel and behave. Such a picture from nearly eighty years ago fascinates both by its detail and by our knowledge of how little seems to have changed. There is an excellent explanatory postface and notes in the French paperback edition, and the map is adequate, too. It was good to come back to this classic travel account from the 1930s, a journey through the unknown from Peking (as it was then called) to India, through wild and lawless territories, during various Chinese civil wars, without real authority and never knowing whether one might be turned back at any point… whilst making one’s way through some of the most inhospitable territory on the planet. Fleming was a correspondent for The Times, and had made several other interesting and arduous journeys previously; he has that gung-ho British upper-class game-for-anything approach, without being a twit, and on this journey he travelled with the Swiss adventurer Ella Maillart, for the sole reason that they both wanted to make the journey, and thought it might be easier for them to succeed together; they survived the seven months that it took, and seem to have made a decent team, at least from Fleming’s account. It is clear how his admiration of her stamina and capacity for organisation and endurance – from an amateur like himself to the professional Ella, as he himself puts it – increasingly impressed him. I shall, sometime soon, re-visit her account of the same journey in Oasis Interdites. It’s clear that the two of them were basically 1930s hippies with a ‘well, let’s go and see what happens’ approach. I am still astonished by the rudimentary nature of the gear that travellers took with them in the past; theirs included marmalade, cocoa, six bottles of brandy and… two typewriters! Fleming closely observes and record the details of their journey, and maintains a philosophical attitude to the possibility of failure. He is urbane, civilised, curious, interested; he takes the time and several chapters to clarify the various Soviet (and British, and Indian and Chinese) machinations going on in Xinjiang province. And he remains calm when faced with interminable waits and delays where they are at the mercies of various officialdoms and dare not insist too much given the inevitable irregularities of their situation… A dry sense of humour keeps him optimistic, and sane. His ode to tsamba, the staple diet of the region, is a masterpiece. The regions through which they travel are incredibly remote; many people have never seen a European before. Just when you think they cannot head into somewhere more remote, they do. It is a seriously long, dangerous and gruelling journey, of the kind it is no longer possible to make in our times, and it isn’t just the phlegm of a certain kind of Brit, or the organisational capabilities of a more seasoned adventurer, that get them through the two thousand plus miles. It is the urge to do something not done before, to see if it might be possible. On Fleming’s part there is a certain amount of curiosity about the territory and its peoples, and a recognition that this world, so very different from the one he is heading back to, has its attractions despite its arduousness. The last stages of their journey, down into British India – the Raj – are positively surreal, both for the travellers and the reader. This is the nearest I’ve come to an account of Ella Maillart‘s life, although it’s written by an admirer, and is selective in its detail, rather too eulogistic to be a true biography. Indeed, I know of no other travel writer who seems to have established such a cult following of – worshippers is too strong a term – younger followers who seem determined to track her every footstep as far as is possible, in the quest for what exactly I’m not quite sure. Clearly, Maillart exerts quite a spell. She spent her younger years learning to sail with a friend on Lake Geneva; she was a sporting type generally, uninterested in academic achievement or success. She came to crave adventure early, experiencing, in common with many others of her time, the strong desire to leave post-Great War Europe far behind, regarding it as a world and a way of life that had completely lost its way and meaning in the recent horrors. Thus her need to travel gradually became an awareness also of her need to explore within, and find meaning to her life, for herself; re-reading this book I was much more aware of her roaming as a quest for inner meaning and purpose, too. Despite all her hopes, her sailing and navigation skills never got her anywhere exciting, and she found herself drawn to Asia, where perhaps the people and life would be different. She set off for Moscow by train with only a rucksack full of food, and stayed for months as a curious observer of the new and totally different world of the Soviet Union, though never deceived into imagining it a utopia, as many Westerners of the time were. There followed a number of lengthy trips into the Caucasus, to Central Asia, to China during the civil war and period of Japanese occupation of Manchukuo, from where she travelled back over the Himalayas to India in the company of English Times correspondent and traveller Peter Fleming (his account of this journey, in News From Tartary, is an excellent complement to hers), to Persia and Afghanistan, and finally to India, where she came to a halt. 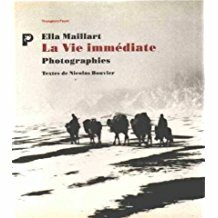 Maillart supported herself and her frugal needs through her writings, photography and occasional film-making, and giving public lectures and conferences on the far-flung places she had visited; she had many contacts with well-known writers, travellers of her day. Her present-day admirers and followers, in Europe rather than in Britain where she remains relatively little-known, seem to be attracted both by her travels and adventures, and her inner quest, reflecting, I suppose, the relative emptiness that more and more people find in our society and our civilisation, where money, material goods and consumption seem to be the main reason for existence. I find her story attractive and interesting, but I certainly don’t share her sense of adventure! Her enjoyment of the different, the other, and her search for deeper meaning to life I very much do share, and revisiting this book, particularly the closing chapters about the second half of her life, when she had largely retired to a small village in the Swiss mountains, I came to understand her better. There is no side to her, and a genuine rapport with those among whom she travels and shares a common humanity: in this, for me she resembles Wilfred Thesiger and Michael Asher. And yet in her restlessness she goes deeper, acknowledging our nomadic past where unending physical movement connects with our spiritual search for significance in a vast and beautiful world. 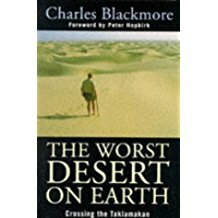 So, no-one had attempted to walk through the middle of this desert before, until Charles Blackmore, and army major, got the idea and contrived to set up a joint Anglo-Chinese expedition to do it. It was another of those semi-bonkers ‘because it was there’ ideas that get people doing insane things. Blackmore and his team enjoy considerable advantages as privileged army and ex-Army folk with contacts with moneyed people in the City; nonetheless the setting up and finding sponsorship for the expedition was not that straightforward. It was certainly useful having people with army logistics experience. The expedition – which took place in the mid-1990s – was successful, and this is Blackmore’s account of it. On the ground, in the worst desert on earth, privilege, money and experience count for almost nothing, and it was a very gruelling exploit, touch and go due to illness, lack of water and friction between the British and Chinese. From what felt – from his account – like a typically old-fashioned British gung-ho approach to preparation and organisation, almost as if it were a spot of Munro-bagging, we move to serious slow trekking through extremely difficult terrain without any real maps: in spite of modern technology, almost nothing is known or recorded about a huge area, the edges of which were explored by men like Aurel Stein and Sven Hedin a century previously. It was worth a read, and clearly was an astonishing achievement, although in the end the book wasn’t quite the account I had been looking forwards to. 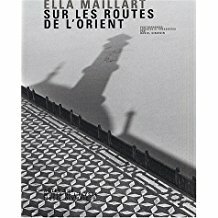 Many years ago when I was on holiday in France, I asked a bookseller in Dinan about travel writing, and he introduced me to the writing of Ella Maillart, a Swiss woman who travelled widely in the Middle East, China and India in the 1920s, 30s and subsequently. I never looked back: this was the last and hardest to find of her books, so my collection and enjoyment is complete. It’s a book of her photos from many of her journeys, taken with her trusty Leica camera – she was one of the first people to have one – presented and introduced by her friend and traveller Nicholas Bouvier. There are some marvellous images that take one back into the first half of the last century, in distant parts of the world, atmospheric because of their age. They may lack the full-colour splendour of what the National Geographic magazine used to print, but they make up for it for me in their connection with one of the last few real travellers. Maillart travelled in the Soviet Union in its early days, reaching places she wasn’t meant to go to; she travelled in central Asia; through China to India in the days of the civil war and Japanese invasion, in the company of Peter Fleming, a correspondent for The Times (his account of their trip, News From Tartary, is also well worth reading); in Afghanistan at the start of the Second World War and in India during that war. And her travels were hard work, gruelling, in the company of local people. She couldn’t escape from difficult situations by hopping on a plane or a train, she didn’t ease her poor Western limbs and sensibilities by taking time off in a luxury hotel when she got tired… she experienced the real life of the places through which she travelled, the difficulties and the hardships, and these willingly, as she gradually came to realise that she was not just on a physical journey, but on her own emotional and spiritual journey of self-discovery. It’s for these reasons that, to me, her observations and accounts feel far more real and interesting than most more recent travel-writing. Initially Maillart wrote in French but soon turned to English so that most of her writings are accessible here, although also long out of print: she hasn’t been re-discovered yet. She used the proceeds from her writings – books and magazine articles – to finance her travels. She was extremely lucky to have been Swiss, in the sense that the two world wars did not directly impinge on her in the ways in which they would have done to almost any other European; she and her friends were appalled at what Europe had managed to do to itself in the Great War and were quite happy to leave it behind; equally, as the next nightmare approached, Maillart left for the other sideof the world. I find her writing inspirational, in a way: she threw herself into her travels and became a part of them. There’s no European standing aloof or apart from people and places, and pontificating about them: she participates, shares, describes with a humility and an equality as well as an enjoyment of where she is and what she is doing, that is simple, healthy and life-enhancing, and I admire her more than any other traveller I have come across so far.